It’s been 45 years. Even though I hadn’t been born yet, it doesn’t seem like Star Trekcould have begun that long ago. And there’s good reason for that. I grew up a child of the 80s, born in 1978, right between the year Star Wars changed the face of science fiction and space fantasy filmmaking and the year Star Trek was re-established as a franchise by Star Trek: The Motion Picture. By the time I was aware ofStar Trek, it was already over 20 years old. So, you’d think 1966 would seem the age of the dinosaurs to me, but it doesn’t. I grew up on a steady diet of both my contemporary pop culture and the music, movies and TV of the 1950s and ’60s. I could sing the theme songs to Mister Ed and The Addams Family as easily as I could tell an Autobot from a Decepticon. For me, having had such easy access to their culture, history and entertainment, the 1960s have never felt like very long ago. Still, I cut my Star Trek teeth on the original crew films and the Next Generation TV series, so what I saw of the Original Series at first seemed a bit hokey. I snickered as the actors inserted solid color blocks they called “tapes” into slots they loosely fit into and asked how anyone could believe the characters onscreen were using a real computer. I respected the series’ place in history, but didn’t give it much serious consideration. As I’ve gotten older, though, I’ve seen that series anew and have grown over the years to deeply appreciate both its foundational importance to the later generations of Star Trek that have so strongly influenced me and its status as something wholly different – and immeasurably important – in the TV landscape of its time. The ideas driving Star Trek come to the core of universal, human struggles and values. Because of that, and because the times, places and technologies of Star Trek are mostly unencumbered by immediate historical references or cultural trends, the stories and characters reach out and meet us where we are in unique and sometimes surprising ways. This timelessness was designed into the show from Gene Roddenberry’s initial conception for that very reason – when we can view issues of human relevance apart from cultural trappings and political ideologies, we can often see them through entirely new eyes. The vibrancy and and immediacy of the Star Trek narrative was demonstrated to me just this past weekend as I spoke with a magazine editor, whom I believe is in his 50s, about his experience of the movement for the civil rights of black Americans in the 1960s. As a boy growing up in white America during that period, his television continually brought him images of protests, riots and armed police forces with dogs and batons turning fire hoses on men, women and children because of their race. 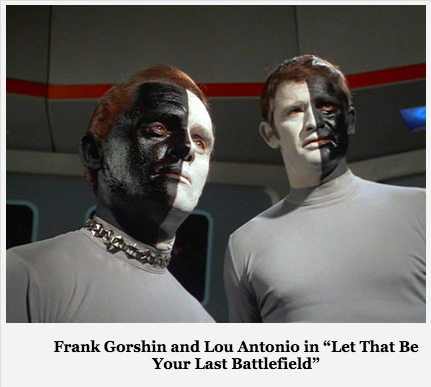 But later at home, on his family’s black-and-white television, he saw the original broadcast of the now classic Star Trek episode, “Let That Be Your Last Battlefield.” I asked him if it changed his perspective. “Oh, you bet it did!” he exclaimed, “Right then and there!” And, thanks be to God, he hasn’t been the same since. As he described watching that episode and reading in it a deeper message of justice and peace that spoke to his heart, the power of that moment for him seemed as immediate as the day he saw it. In that moment, Star Trek was not a 45 year-old television program. It was a message of human compassion that changed my friend’s heart and its effect was as present and current in his life as ever. As I thought more on my friend’s story, I had to wonder what would have happened if those nuns, who likely shielded themselves from such “secular” fare, had watched “Let That Be Your Last Battlefield.” Would they have been moved as my friend was? Would their hearts have been pricked as was his? I would hope so. Because at that time, Star Trek was doing a better job of representing the Gospel to its culture than were that school’s cloistered sisters, who were supposed to have dedicated their lives to Jesus. 45 years seems like a long time, especially in today’s pop culture world where it often seems that nothing but the most immediate releases are deemed worthy of discussion. But for me, just as it is for Trekkies I know who are a decade or more younger than me and love the Original Series and just as it is for those who watched the very first broadcasts, Star Trek is young yet. It still speaks to the hearts and minds of those who experience it and remains continually relevant to the human journey. So, Happy Birthday, Star Trek! May you continue to Live Long and Prosper.